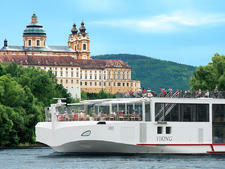 Daily shore excursions and wine with lunch and dinner are among the inclusions on Viking Tialfi, one of the six 190-passenger Longships launched by Viking Cruises in April 2016. 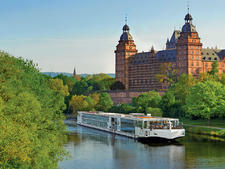 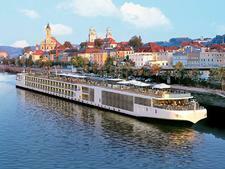 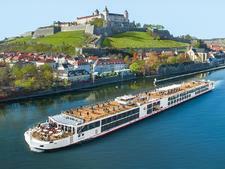 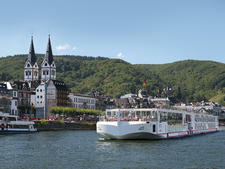 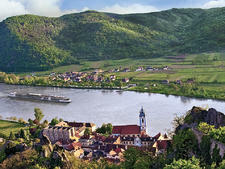 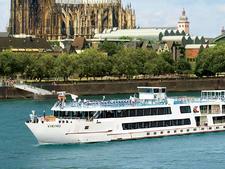 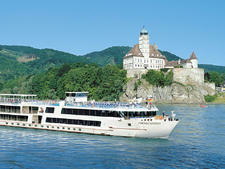 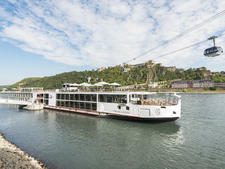 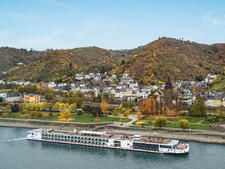 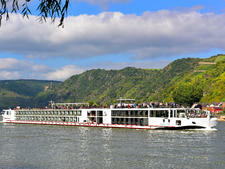 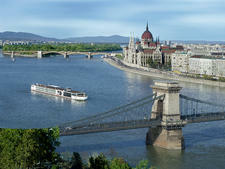 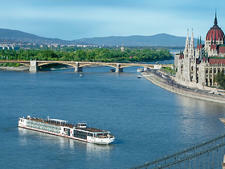 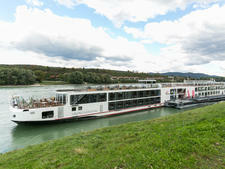 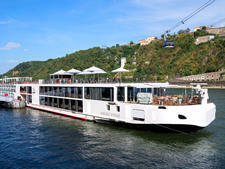 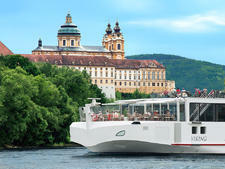 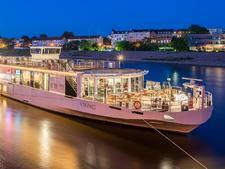 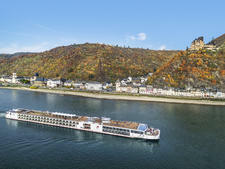 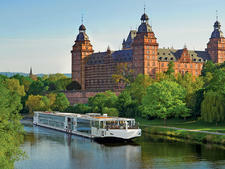 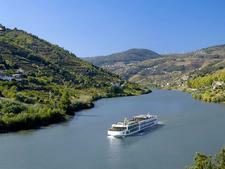 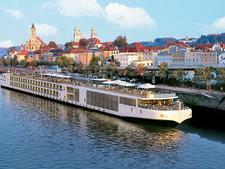 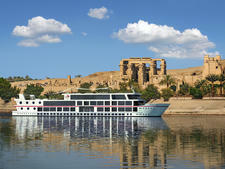 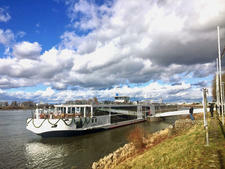 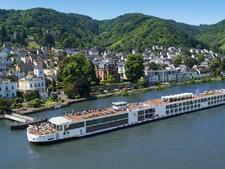 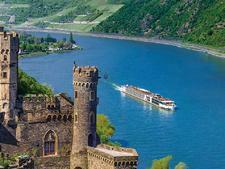 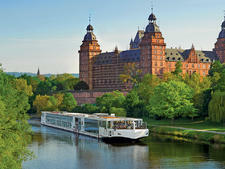 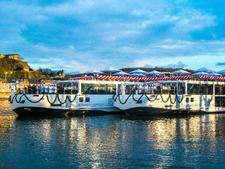 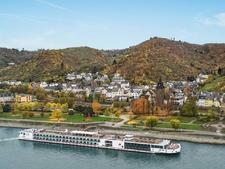 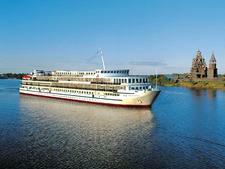 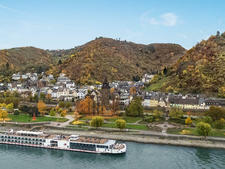 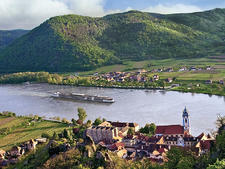 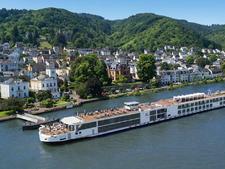 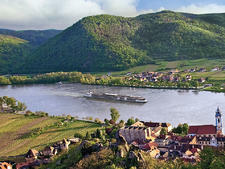 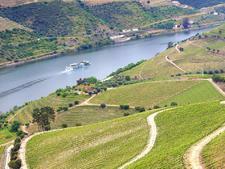 Tialfi is almost identical to the other Longships, first debuted by the world's largest river cruise line in 2012. 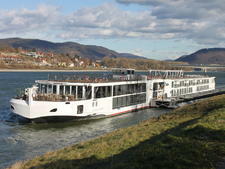 By moving the corridors off center, Viking introduced a large number of balcony cabins; once a rarity on European river vessels, which are restricted to a uniform size in order to navigate locks and low bridges. 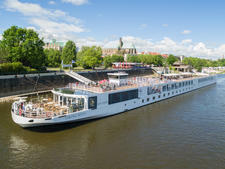 Another Viking innovation on Tialfi is the Aquavit Terrace, an alfresco lounge and dining area that was created by building the Longships with a blunt, rather than pointed, bow. 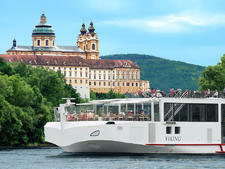 The 95 cabins are located on three passenger decks and, in common with the public areas, reflect Viking's trademark Scandinavian style. 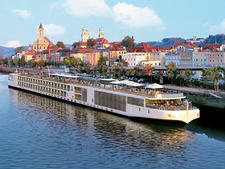 Light, airy and unfussy, color palettes are muted and there is extensive use of blond and pale wood effects in both furniture and paneling. 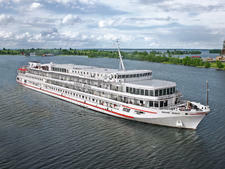 Unusually, the largest two-room Explorer Suites, measuring 445 square feet and with a wraparound balcony, are located above the engines at the aft of the vessel. However, the ship has "green" hybrid diesel-electric engines that burn less fuel and produce 20 percent fewer emissions, making Longships cleaner, quieter and with less vibrations than some of their competitors. 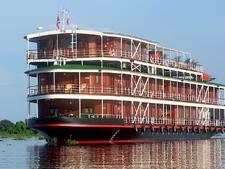 Also situated with the two Explorer Suites on the upper deck are seven Veranda Suites, which measure 275 square feet and have a bedroom, living room, walkout balcony and French balcony. 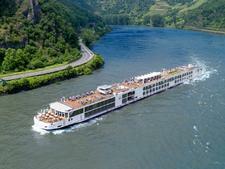 In addition, there are 20 Veranda Cabins on this deck, which measure 205 square feet including the balcony, and five French Balcony Cabins -- all 135 square feet. 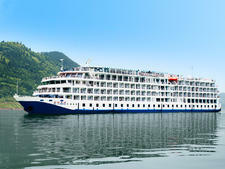 There are 19 Veranda and 17 French Balcony Cabins on the middle deck and 25 Standard Cabins on the lower deck, which measure 150 square feet and have a fixed window situated high in the wall. 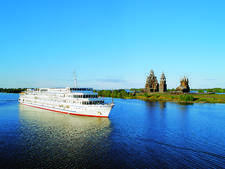 There are some design changes in the Explorer Suites compared with the earlier Longships, including a fixed rather than sliding wall between the bedroom and living area, and tweaks in the bathroom with one wash basin instead of two, which in turn has made way for a larger shower. 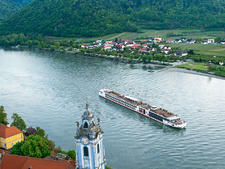 For the uninhibited, the floor-to-ceiling shower window overlooking the river can be turned from opaque to clear glass at the flick of a switch! 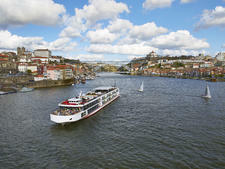 In common with all the fleet's Longships, L'Occitane toiletries have been replaced with the line's own brand, Freyja products, introduced when Viking launched its first ocean ship in 2015. 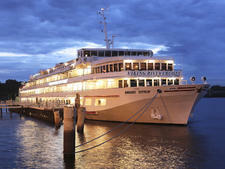 Meals are served in the main restaurant on the middle deck. 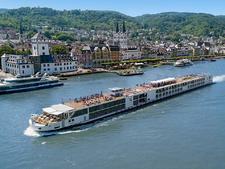 Breakfast and lunch feature a buffet with served items from the menu, and dinner is a served three-course meal with the option to add extra appetizer courses and a cheese plate. 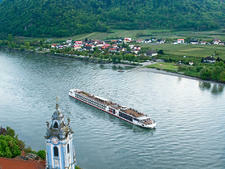 In addition to regular dishes, menus showcase regional food and wine, such as local cheeses and gin in the Netherlands, and specialty sausages and beer in Germany. Vegetarians always have something to choose from and there is an "always available" menu of salmon, steak and Caesar salad. 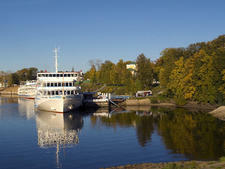 A lighter breakfast and lunch alternative is served in the Aquavit Terrace. 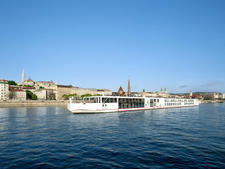 Complimentary beverages are available from the self-serve tea and coffee station, which is open 24/7, and snacks such as cookies and muffins are available during the day. 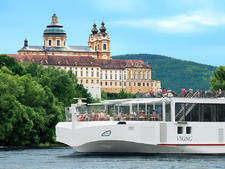 Viking's policy is that passengers must be 18 to cruise on the line.